Why is Flatwoods a gorgeous place to ride a bicycle and host the Bicycle Bash Festival on NOV 6? SWFBUD's 12 Bike Shops -- The bike stores will be on hand to show you the latest and greatest in bicycles. Free bike helmets for kids -- Hillsborough County Sheriff's Office will be giving free bike helmets to kids. Also, there's a free bike gear drawing at 2:30 pm! 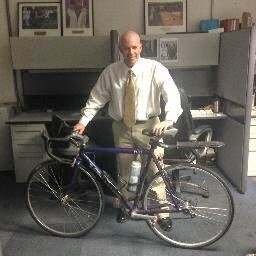 Bikin' Bob -- Tampa Mayor Bob Buckhorn will be leading a bike ride around the 7-mile loop at 11:15 am. Incredible Food -- led by the famed Taco Bus Food Truck. The Killer Samich and La Creperia Cafe food trucks will be there, too, along with the Queen of Sheba Ethiopian and The Little Greek restaurants. Bicycles of all sizes! The Bicycle Bash is a festival for all bicyclists, bicycles and bike groups. It’s happening again. Just one month ago, Sen. Coburn (R-OK) failed in his efforts to strip funding for Transportation Enhancements from the six-month transportation extension. Now, Sen. Rand Paul (R-KY) is taking the lead in trying to destroy Transportation Enhancements. On November 1, the Senate will finalize the transportation appropriations bill, which sets funding levels for FY2012. Sen. Paul has offered an amendment to redirect all funding for Transportation Enhancements to bridge repair. We agree on the need to keep our bridges safe, but the lives of pedestrians and cyclists are important too. Thirteen people died when the Minneapolis bridge collapsed in 2007: since then, close to 20,000 pedestrians and 2,800 cyclists have died on our nation’s highways, largely as a result of poor highway design and a lack of safe non-motorized infrastructure – exactly what the enhancement program was created to fix. 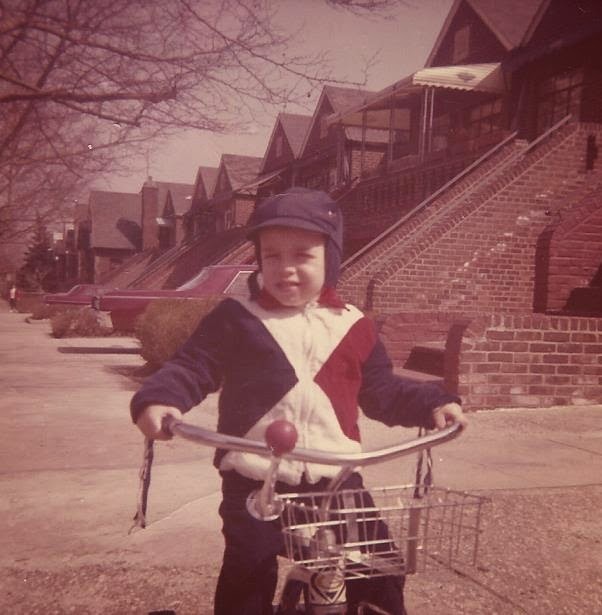 If Sen. Paul’s amendment is successful, it would eliminate approximately $700 million in federal funding for FY2012 that is used to construct sidewalks, bike lanes, bike paths, trails and other infrastructure that makes it safe for bicyclists and pedestrians to get around. Even if every penny of these funds is diverted to bridge repairs, Senator Paul’s plan will still take 80 years to fix the backlog of bridge repairs we have today. Remember that the TE program represents less than two percent of the Federal transportation program and these projects help alleviate traffic congestion, improve safety, get people active, and create more jobs per dollar than highway-only projects. Last month, we asked you to contact your U.S. Senators to oppose Oklahoma Senator Tom Coburn's plan to strip funding from the Transportation Enhancements program, which is the main source of the federal investment for bike projects of all types. Peopleforbikes.org supporters and our allies generated more than 75,000 emails to Congress in 48 hours. This rapid and powerful grassroots response succeeded: Mr. Coburn withdrew his amendment and crucial funding for bicycling was preserved. We are sorry to report today that bike infrastructure funding is under serious and immediate attack again – this time in an amendment proposed by Senator Rand Paul (KY) that would redirect all funding for Transportation Enhancements to bridge repairs. Mr. Paul's amendment is set for a Senate vote Tuesday, Nov. 1. 1. Everyone deserves to be safe. We agree that we must keep our bridges safe, but the lives of pedestrians and bicyclists are important too. Nearly 5,000 Americans die each year biking or walking on our nation’s roadways. 2. Reallocating bike funding won't make a dent in the cost of bridge repairs. Even if every penny of Transportation Enhancements money is diverted to bridge repairs, Senator Paul’s plan would still take 80 years to fix the backlog of bridge repairs we have today. 3. Transportation Enhancements provide essential transportation benefits, like reducing road congestion, improving safety, getting people active, and creating more jobs per dollar than highway-only projects. 4. States don't spend all the money they already receive for bridge repairs. This is the third attempt in a month by a small group of Senators to target Transportation Enhancements, using a different angle each time. It is a waste of the Senate's time and taxpayers dollars to focus on eliminating this modest, cost-effective, valuable program when we are in dire need of real and viable solutions to fix our failing transportation system. Thank you for your help today, and for passing this call to action along. What a blast to work with talented glass artist Susan Gott to inaugurate the first ever Free Wheeling Art and Antique Bicycle Ride, which started and finished at Susan's Phoenix Glass Studio at Knollwood and Nebraska in Seminole Heights. I led a ride of 25 terrific bicyclists who came from St. Petersburg to Wesley Chapel to my own neighborhood here in Seminole Heights. It was a gorgeous day to bike with my 'hood pals such as Rick, Dale, Lisa and CJ and meeting many cyclists who enjoyed biking to the art studios of Susan Gott and wood scuplturer Charlie Parkhill and the Tempus Project and also stopping off at terrific antique shops like Sherry's Yesterdaze, D & D Antiques and Kaleidoscope. And we even met Mayor Bob Bukshorn, who was on his way to the Food Truck rally in Seminole Heights. There's mason-bicyclist Dale Edminster, mesmermized by the cool Kaleidoscope items. A gorgeous day to bike. Thank you Debra Vallejo, who hosted us at D & D Antiques. We met Mayor Bob Buckhorn on the way to Sherry's Yesterdaze. Sherry opened her store to the bicyclists, who enjoyed checking out her wonderful vintage clothes and items. Thanks Sherry! Nicole and Tracy of the Tempus Project discuss the art work in its gallery. Tracy chats with an arts blogger, who rode a very cool single-speed Paramount. Come on, I have to try one photo that's framed by a bike frame. Here's my idea of art. Susan Gott rocks. The talented artist with gorgeous glass works held one-on-one demos with guests who were guided by Susan to make their own glass pumpkins this afternoon after the ride. A 55-year-old bicyclist was killed biking across the eastbound lanes of West Waters Avenue Sunday. SeminoleHeightsPatch.com has the story. 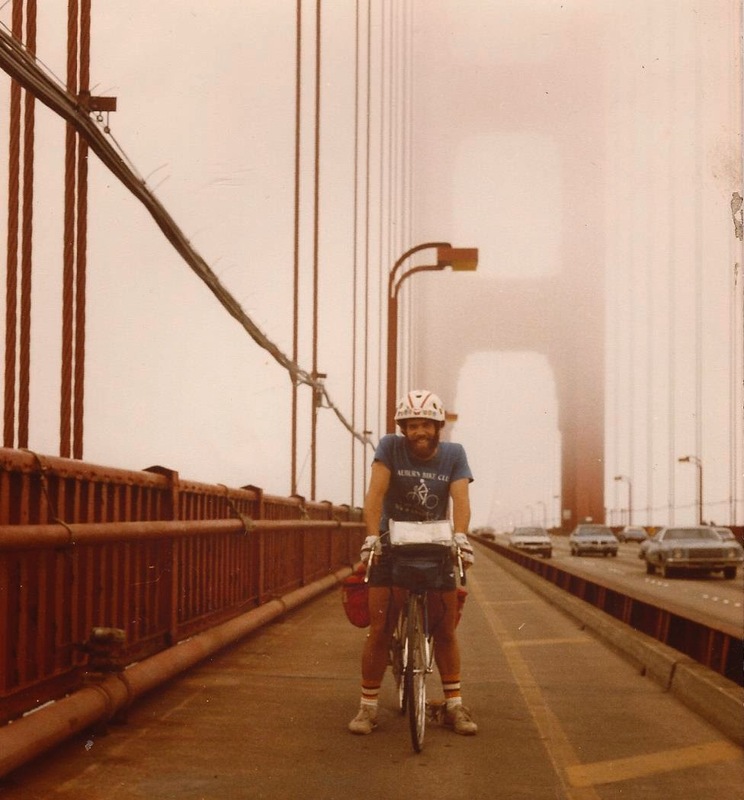 Michael Swanson was the bicyclist's name. There are so many motorist-bicyclist crashes in Tampa Bay that hospitals use billboards for ads showing a bicycle to drive business. Consider this billboard in Pinellas County. Kudos to Hillsborough County TV and Commissioner Mark Sharpe for this terrific promo video for the 2011 Bicycle Bash Festival. 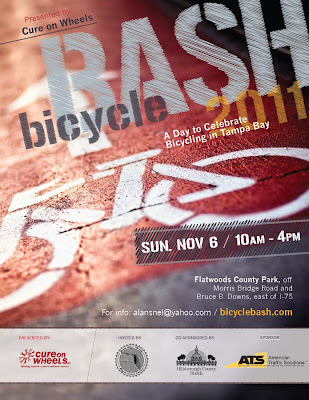 TAMPA -- SWFBUD, the alliance of Tampa Bay bicycle stores, is proud to put on the 2011 SWFBUD Bicycle Bash Festival to celebrate bicycling in the Tampa Bay market at Flatwoods Park on Nov. 6 from 10 am to 4 pm. The Bicycle Bash is Tampa Bay's bicycle festival and SWFBUD's 12 retail bicycle shops hosts the bicycle festival to bring Tampa Bay's bicycle community together and promote bicycling as a healthy lifestyle, effective transportation and asset to the region. -- Tampa Mayor Bob Buckhorn leading a bike ride called the Buckhorn Bash Ride around the Flatwoods 7-mile loop at 11:15 AM. -- The SWFBUDDY Awards given to local Tampa Bay residents and officials who have worked to make the area a more bicycle-friendly community. -- A Swap Meet where people can buy used bike gear; food provided by the famed Taco Bus Food Truck; and music. -- Guest announcers Skip Mahaffey and Brendan McLaughlin of Channel 28 Action News. 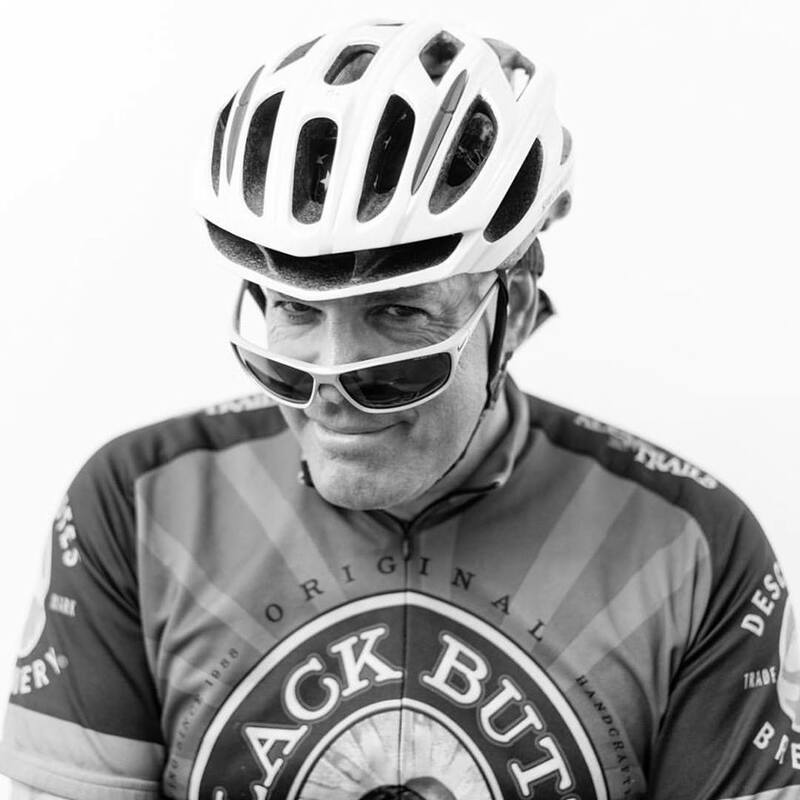 -- SWFBUD lawyers will be on hand to offer free legal advice regarding bicycle issues. -- Tampa BayCycle will provide a free BikeSmart bike education class and Tampa Bay's bicycle clubs will be on hand to talk about bike rides throughout the region. Bikes Belong from Boulder, Colo. and the Florida Bicycle Association will also be participating. HART and the MPO will be on hand, too. -- The Bicycle Bash is FREE. -- The Cure on Wheels charity bike ride (www.cureonwheels.org) is the Bicycle Bash presenting sponsor and Hillsborough County is a co-sponsor. SWFBUD is a nationally-recognized, award-winning alliance of 12 Tampa Bay bicycle stores: Carrollwood Bicycle Emporium, Oliver's Cycle Sports, Bicycle Outfitters, Just Ride Bicycles, Chainwheel Drive, ABC Bicycles, Trek Bicycle Store of Tampa and Clearwater, Street Fit 360, University Bicycle Center, Trek Bicycle Store of St. Petersburg, The Ironman Store and Velo Champ. SWFBUD also includes three lawyer members: Tom Singletary, J. Steele Olmstead and the Mark Roman Law Group. SWFBUD's achievements include prompting Hillsborough County to initiate a bicycle safety action plan in response to local bicyclist deaths and also prompting local officials to consider a regional paved trail system called the BAM (Bicycle Area Mobility) Network. Please log on to www.bicyclebash.com and www.bicyclebash.blogspot.com for more information. If you want to be an exhibitor/vendor, log onto www.bicyclebash.com to get a form or contact alansnel@yahoo.com. We also have the swap meet, the Taco Bus food truck, guest announcers Skip Mahaffey and Brendan Mclaughlin and our SWFBUD bicycle shops and lawyers: Carrollwood Bicycle Emporium, Olivers's Cycle Sportsm Just Ride Bicycles, Chainwheel Drive, Univerfsity Bicycle Center, Bicycle Outfitters, ABC Bicycles, Trek Store of Tampa and Clearwater, Street Fit 360, The Ironman Store, Trek Store of St. Petersburg, Tom Singletary, Mark Roman Law Group and J. Steele Olmstead. Thank you sponsors -- Cure on Wheels, our presenting sponsor; Hillsborough County, our co-sponsor; American Traffic Solutions, a sponsor. We also have incredible bicycle groups coming -- Tampa BayCycle, the St. Petersburg Bicycle Club, Suncoast Cycling Club, SWAMP, Seminole Heights Bicycle Club, the Florida Bicycle Association, Bikes Belong and the Tampa Bay Bicycle Co-op. Organizations and agencies in attendance include -- the Sierra Club, HART, Hillsborough County MPO/Planning; Hillsborough parks and recreation. Please support the Cure on Wheels bike ride on NOV 5 from Flatwoods. Cure on Wheels helps out on the Bicycle Bash and raises money locally for the families of cancer patients going through treatment. Their 350 riders raised $165,000 last year! Log onto www.cureonwheels.org to sign up. Sun came out this morning and I was able to squeeze in my 41-miler before work. But there was some water out in Flatwoods. I am selling my Specialized Sirrus road bike. It's a classic -- a 1991 steel road bike that gives you a rock-solid ride. The frame is just too big for me. Ideal for someone in the 5'6" - 5'10" foot range. I'm selling it for only $200 because there's a small crack in the rear rim, so the rim or rear wheel will have to be replaced. Bike comes with odometer, Armadillo tires, two water cages and two new Polar Bottles. First $200 gets the bike. Contact me at alansnel@yahoo.com. The Bicycle Bash signs are out -- you'll see them around Flatwoods and SWFBUD shops. And the Bicycle Banners are up, too. Rick Fidanzato's crew at Trek Store of St. Petersburg put up a Bicycle Bash banner in front of their store on Fourth Street in St. Petersburg. This will be their first Bicycle Bash. SWFBUD's newest bike shop is Velo Champ in Seminole Heights. Jordan Miller plus dad Doug and mom Sue make Velo Champ a family-run busines. They strung up the Bicycle Bash banner on their storefront on Central Avenue. SWFBUD (South West Florida Bicycle United Dealers), the alliance of 12 Tampa Bay retail bicycle shops, is proud to announce this year's SWFBUDDY Award winners who will be honored during the SWFBUD Bicycle Bash Festival at Flatwoods Park on Nov. 6. -- Tampa City Councilwoman Yolin Capin, for her support of shared road markings ("Sharrows") that have been placed on various streets in the city of Tampa. 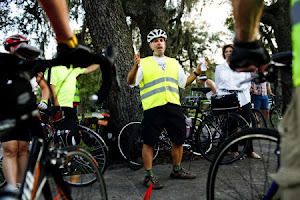 Councilwoman Capin also delivered a stirring speech at the Hub Grub Bicycle Ride in Seminole Heights in April. -- Zachary Taylor, wellness specialist for the city of Clearwater's parks and recreation who started a bicycle sharing program. -- Tampa Bay Rays Manager Joe Maddon, for showing his love for bicycling during various media reports and doing a bicycle safety PSA. -- Alicia Zicchino, Catherine Fritchman and Dan Magazu, for reaching out to the bicycle community and holding a bicycle memorial event to honor the life of bicyclist Dr. Robert Niedbalec, who was killed by a speeding motorist while cycling on Fletcher Avenue in Tampa in February. -- Tampa Police Department, for applying Share the Road decals across the entire width of the rear window of its police cruisers. -- St. Petersburg Councilwoman Leslie Curran, for her courage to return to bicycling after suffering a serious head injury from a bicycle crash. -- Doreen Jesseph of Seminole Heights, for her generous contributions to donating many bicycle event fliers and supporting Seminole Heights bicycle club activities in Tampa. It's Sunday October 2 and only five weeks to the Bicycle Bash Festival to celebrate cycling in Tampa Bay. I'm proud to work on behalf of 15 SWFBUD members -- 12 bike shops and three lawyers -- who enlist me to increase the profile of bicycling in Tampa Bay, get more people on bikes and show our elected leaders that bicycling enhances our local communities through economic development, tourism, fitness, transportation, healthy lifetsyle and quality of life. SWFBUD prompted Hillsborough County to initiate and pass a bicycle safety action plan, has represented the voices of bicyclists before many local agency boards and elected panels and puts on the Bicycle Bash every year to celebrate and promote bicycling in Tampa Bay. I'm lucky to work for 12 amazing bike shops and three lawyers who believe in the SWFBUD mission. The Seminole Heights Bicycle Club's Easy Ride drew about 10 cyclists this morning. Here is Eddie, pedaling along. He started on training wheels in the club. 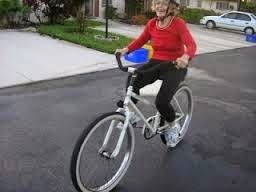 Good to see Margaret back in the saddle after an ankle injury.